Hoop Camp is all about the community. Our organization provides opportunities for individuals, businesses, and corporations to get involved at the community level. Not only are we a non-profit 501(c)(3) organization, but we are a TRUE non-profit. We are all volunteers we have no paid staff. Your donations help us run our camps and provide support for those with a wide variety of special needs. Our “unified” format and diversity of ages, abilities, faiths, and backgrounds fosters strong community bond. Every dollar of your donation goes directly to camp. All staff, coaches, Board of Directors are volunteers. Hoop Camp is a 501(c)3 non profit organization; we are always in need of donations both in-kind and cash contributions. All donations are tax deductible. 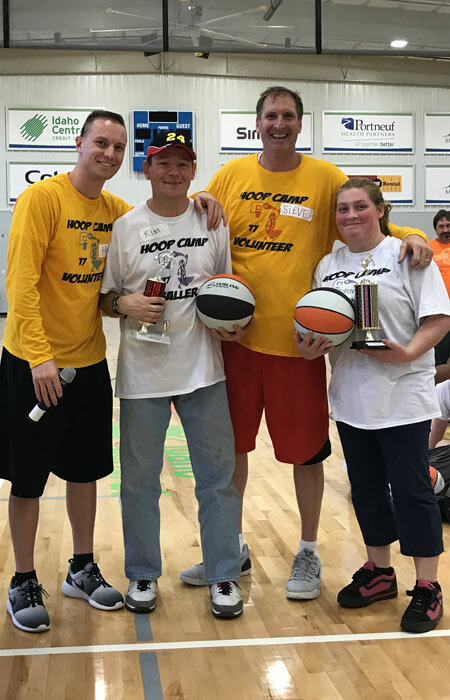 Thank you for your interest in volunteering at Hoop Camp, a basketball camp for children and adults of all ages in our community with special needs. All our athletes have a variety of abilities and it’s important we adjust drills, games and contests based on individual ability so all campers can enjoy success. Most of our participants range in age from 6-50 years of age, so make sure you can adjust our drills contests and games accordingly. Bring your basketball attire and lots of energy. The morning is dedicated to fundamental drills and contests like free throws, hot shot shooting, dribbling, ball handling, passing, lay-ups, etc. Our emphasis is not on competition but rather fun for everyone involved. Teams of 8-10 players and will need 3 or 4 coaches per team. Safety is our number one concern, so you need to be aware of where your players are at all times. Be positive at all times and make sure you contact one of the camp directors immediately if someone is hurt or needs any assistance. Check in begins at 8:30 am each day. Please arrive early to assist with check-ins, connect with players, and receive instruction on the activities for the day. Please plan on staying until 2:30 p.m. to help with checkout and cleaning. Drinks and lunches are provided for all volunteers. All volunteers need to be at least 16 years of age. If you have any additional questions, please call our director Steve Garrity at (503) 875-8281.